-- Navantia will invest 160 million euros in the next 4 years to modernize the shipyards of the Bay. SAN FERNANDO, Spain --- Navantia started on January 15, in the workshops of the San Fernando shipyard, the construction of the first corvette for the Royal Saudi Arabian Navy. This symbolic action consisted of cutting the first steel plate for the vessel, belonging to block 401 of the engine room. Its measures 12 x 2.4 meters, is 7 millimeters think and weighs 1,254 kilograms. The event brought together more than 500 workers, a good part of the employees that have designed and will build these vessels and their integrated systems, and who assisted a presentation of the program. Also present were delegations from the Spanish and Saudi Arabian navies, respectively led by the two navies' deputy chiefs of staff, Admiral José Luis Urcelay for Spain and Rear Admiral Fahad Ali Alfuraidan for Saudi Arabia. 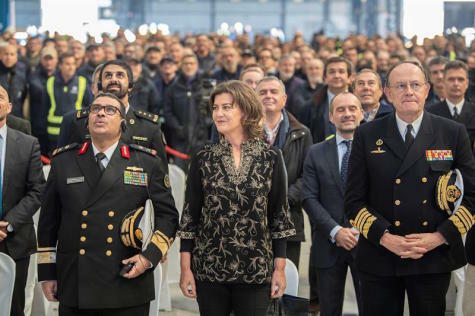 The president of Navantia, Susana de Sarriá, stressed that "this is a strategic program for Navantia, which in addition to boosting economic activity and employment, positions us internationally as a company that contributes to security and defense. It also showcases a ship having high capabilities that can meet the needs of other potential customers in this region of the world, as well as other regions of interest." She also sent a positive message to the workers, stressing that "with the Strategic Plan a new Navantia will be developed around its rejuvenated workforce to guarantee its future and its identity as a company serving the security and defense of citizens." "We are going to further increase our already very relevant social contribution as drivers of the creation of quality employment in the Cadiz region and in Spanish industry," he said. The contract, in force since last November, strengthens the immediate future of Navantia and benefits all the shipyards of the company and its subcontractors, especially around the Bay of Cádiz. Specifically, this program will provide a total workload of around seven million hours that, translated into employment terms, mean 6,000 jobs over the next 5 years. Of these, more than 1,100 will be direct jobs; more than 1,800 jobs in Navantia subcontractors and over 3,000 indirect jobs generated by other suppliers. More than 100 subcotractors and suppliers will collaborate on this contract. The program that begins today, and whose last ship will be delivered in 2022, includes, in addition to the construction of the ships, Life Cycle Support for five years from the delivery of the first ship, with an option for an additional five years. The design of the corvettes is state-of-the-art, maximizing Navantia's participation through the incorporation of its own products, such as the CATIZ combat system, the HERMESYS integrated communication system, the DORNA fire control, the Integrated Platform Control System, the MINERVA integrated bridge as well as motors and gearboxes. On the other hand, the contract also includes the supply of various services such as integrated logistic support, operational and maintenance training, supply of Training and Training Centers for the ships’ Combat System and Platform Control Systems, Life-Cycle Support, as previously mentioned, and systems for the maintenance of the ships in the Naval Base. Today’s event also highlighted that, in 2019, Navantia will commemorate the 230th anniversary of one of the most important scientific journeys in history, the Malaspina Expedition. More specifically, the ships that carried out this expedition were the corvettes “Discovery” and “Atrevida”, both launched at the San Fernando shipyard in April 1789. They were the first corvettes of the new Spanish Armada, and their construction was a major milestone in Spanish naval history because of their multiple capabilities and their high speed. -- Jan 19, 2019: clarified in second paragraph that the two attending admirals are both deputy chiefs of staffs.